1931 - A national anti-grey squirrel campaign is formed to combat the spread of grey squirrels. 1933 - The Destructive Imported Animals Act makes it illegal to import, release, or keep captive grey squirrels without a licence. 1944 - County War Agricultural Executive Committees issues free shotgun cartridges to registered clubs to reduce grey squirrel numbers. By the end of 1947 450 Grey Squirrel Shooting Clubs had killed 100,000 grey squirrels. Grey squirrels continued to spread. 1952 - Around 7,000 Grey Squirrel Shooting Clubs in existence but issue of free cartridges much abused. Forestry Commission argues for greater effort to control grey's through national tail bounty. 1953 - First anti-grey squirrel propaganda on Radio 4’s The Archers. An experimental bonus system introduced to complement squirrel clubs; one shilling or two free cartridges paid per grey squirrel tail. The bounty is raised to two shillings in 1956. 1,520,304 grey squirrel bounties paid in five years with no effect on grey squirrel numbers. The system is abandoned in 1958. 1958 - Trapping shown to be more efficient than shooting grey squirrels. 1973 - The Squirrels order makes it legal to poison grey squirrels with warfarin in areas with no red squirrels. 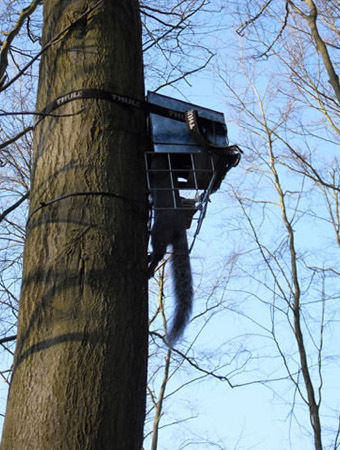 2014 - The EU licence for the production and sale of warfarin as a grey squirrel bait ended on 30 September 2014. Manufacturers and stockists are no longer able to sell warfarin to control grey squirrels. However, users who have stocks of it left can use it until 30 September 2015. 2014 - 2017 - Grey squirrel numbers on mainland Britain continue to rise.